The Oxford Bookstore brand is owned by the Indian Apeejay Surrendra group of companies (43,000 employees), which has interests in many high-growth markets, including tea, luxury hospitality, shipping, logistics, retail and real estate. 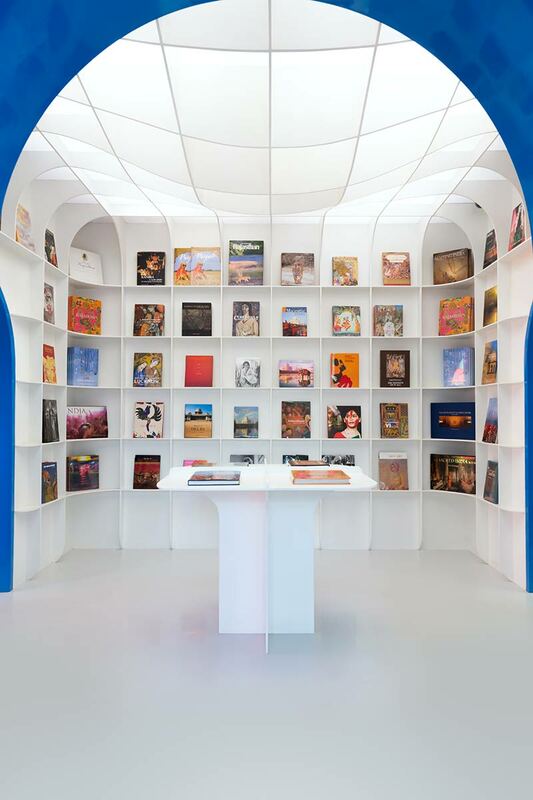 This company, which celebrated its 100th anniversary in 2010, is still managed by the Paul family, which is committed not only to the management of the business, but also to the broader dissemination of culture, which it has promoted through its Indian bookstores since 1929. Oxford Bookstores are environments designed to liberate minds. 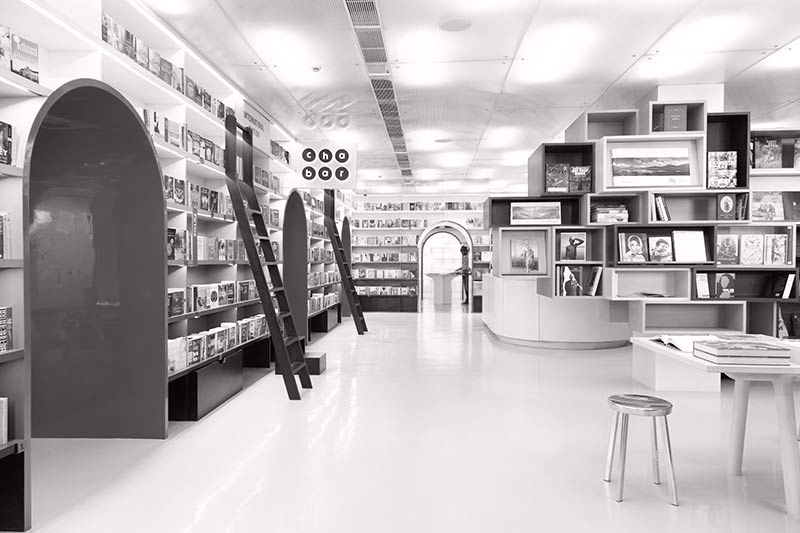 With 30 stores across India, the chain has offered its customers - and especially its younger customers - the broadest range of books available anywhere in India for nearly a century. As the country’s cultural showcase, this brand also organises and hosts the Apeejay Kolkota Festival of Literature, which brings booklovers together with publishers through cultural events in literature, the visual arts and the performing arts. Designed as a concept store, each Oxford Bookstore also incorporates a Cha Bar tea lounge serving a wide choice of organic teas for visitors to enjoy as they relax in a calm and thoughtful atmosphere far removed from the hustle of the city streets. From Kolkata, Mumbai, Bangalore and Bhubaneswar to Hyderabad, Shillong, Silliguri, Guwahati and Goa, the architecture of each bookstore is unique and like no other. 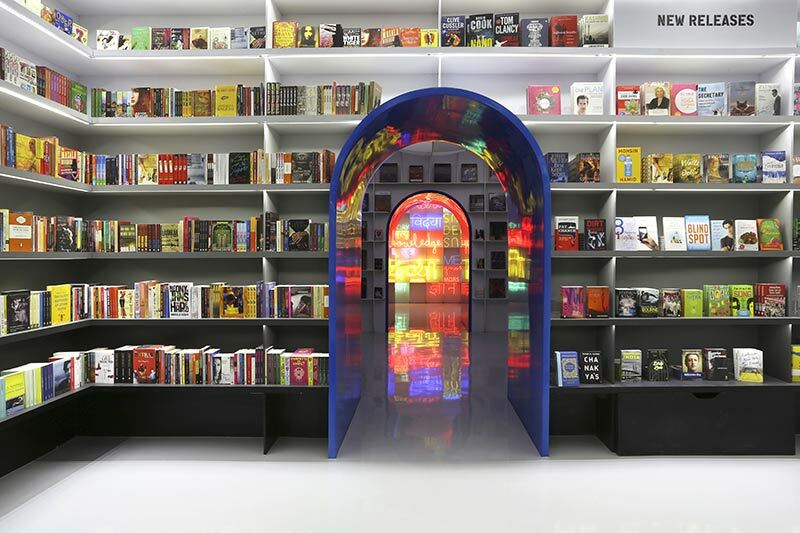 In April last year, Oxford Bookstore officially opened its latest store in New Delhi, designed by Paris-based Normal Studio as its first venture into interior design. The new bookstore is in Connaught Place at the heart the historic business district of the city designed by Robert Tor Russell in the early 20th century; a heritage hotspot of the capital where colonial buildings constructed in two concentric circles witness the grandeur of the British Empire in its heyday. 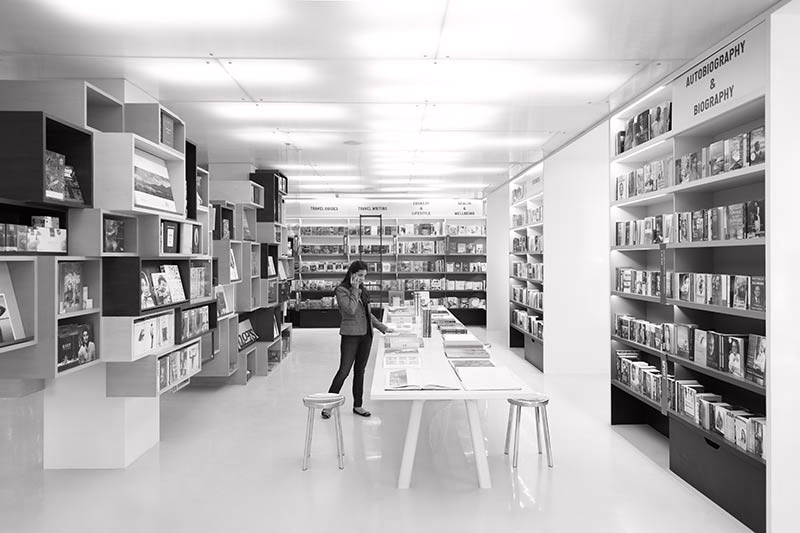 Family member and Appeejay Group Director Priti Paul studied design and architecture at prestigious Harvard University, and that background is clear in the demanding requirements she sets when creating the atmosphere for the company’s bookstores. The New Delhi store was previously located in a modern multi-storey building that made relocation a must. 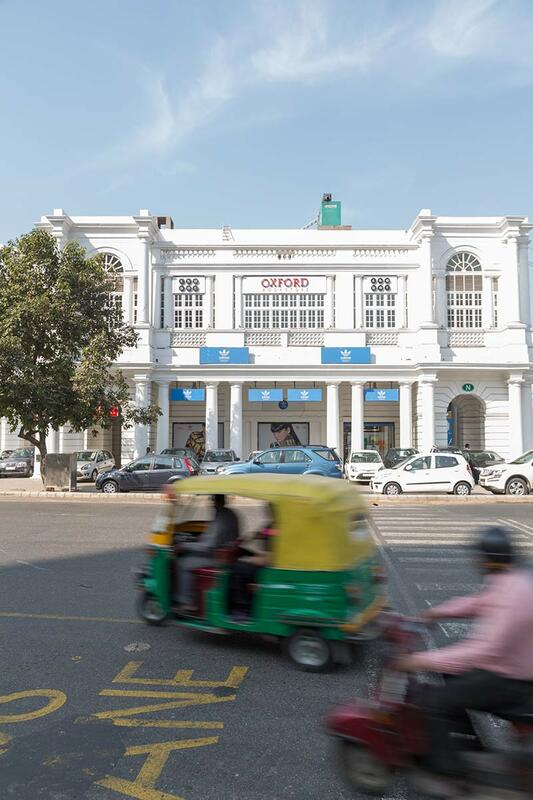 The opportunity to open a 500 m2 store on the first floor of a city centre colonial building - especially one in Connaught Place - was an opportunity she could not resist. This crossroads is one of the capital’s most prestigious business and retail districts, and takes its name from the Duke of Connaught, the third son of Queen Victoria. It is also an area with many secondary schools and colleges. 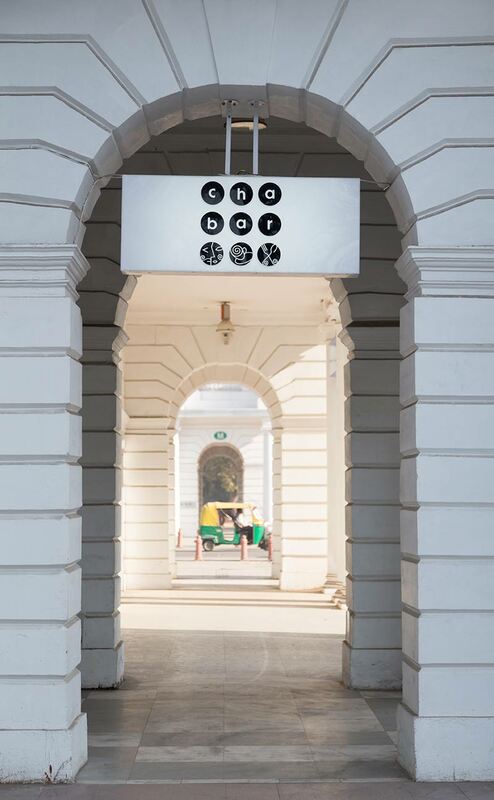 Designing an innovative addition to these exceptional heritage surroundings was the ambition of Priti Paul, who was determined to establish a presence in the historic heart of the capital, where residents and tourists love to stroll in colonnaded shade. Her meeting with Normal Studio reinforced that decision, when the designers suggested doing something with the space other than a straightforward architectural restoration; something that would introduce an historically respectful contemporary dimension. This sensitive approach convinced her that she should give them a free hand within the challenging brief that required the new store to provide spaces for hosting public lectures and conferences, a bar and a restaurant: in fact, all the distinctive features of an Oxford Bookstore. Jean-François Dingjian and Eloi Chafaï saw this first interior design project as an opportunity to interpret their trademark style in a new language. At the very least, it intensifies the minute attention to detail typical of their surgical approach to deconstructing complexity. This project therefore provided the opportunity to test their design experience in analysing every component part of the project, evaluating its necessity and making it recognisably accessible. Drawing has always been their way of thinking and conceptualising. The design duo began by identifying what this fragmented space of only 500 m2 should be essentially about: its flow. It was flow that would govern the unity of the space. It was flow that would provide easy access to books and the associated services of relaxation areas, conference spaces, restaurant and bar. “We didn’t want to design a formal scheme that could be adapted regardless of cost, but rather to enter into the life of the space in a different way, and find a way of dividing it that would adapt naturally to its various functions. 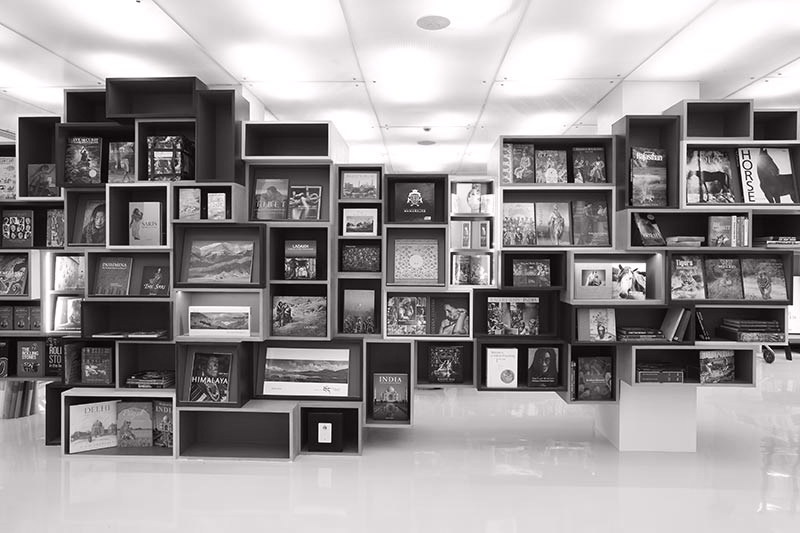 Hence our idea to play with the scale of the furniture and take books as our context”, explain the designers. 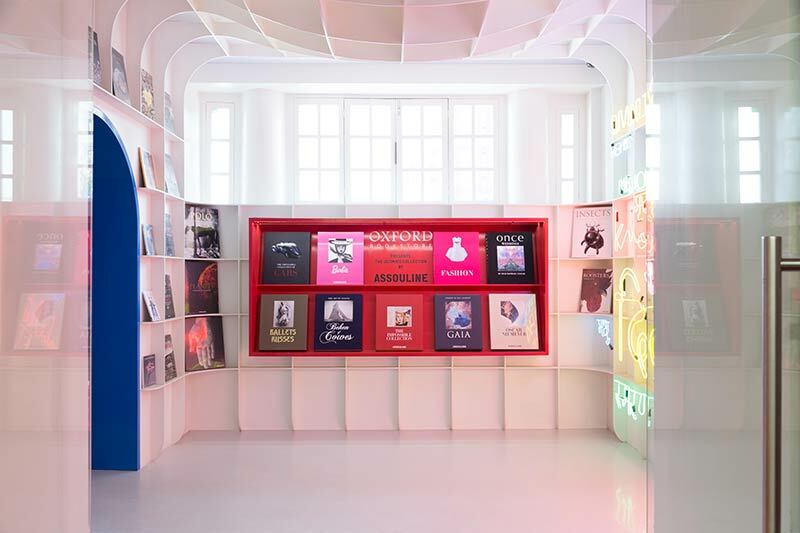 Allowing books to speak and presenting them through materials, light and furniture has resulted in an interior architecture structured around a series of ‘installations’. Each has its own precise function to pace the customer pathway. The resin finish provides the unifying element that makes these micro-spaces feel bigger and interrelated. > The entrance provides the first hint to this division of space. 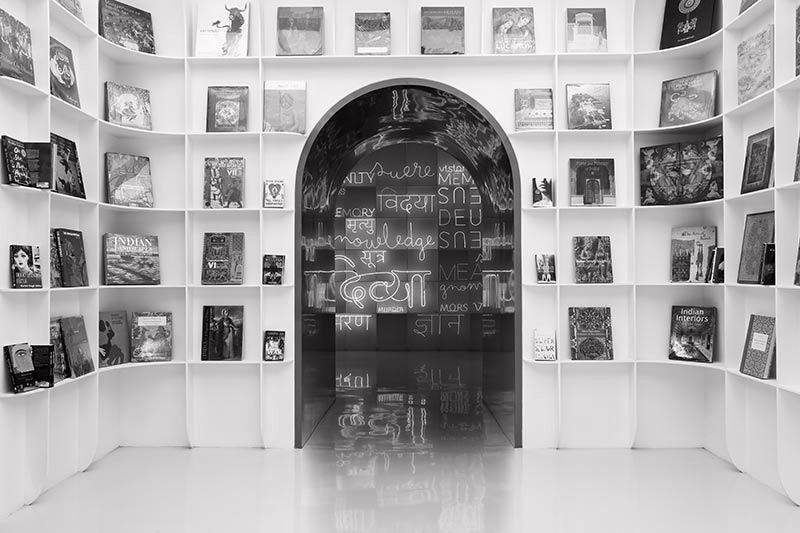 Attention is immediately drawn away from its narrow dimensions by a large-scale neon installation in which a cloud of words from literature plunges the visitor straight into the emotive world of reading. Comprising two small rooms, this entrance space is effectively the shop window of the bookstore. 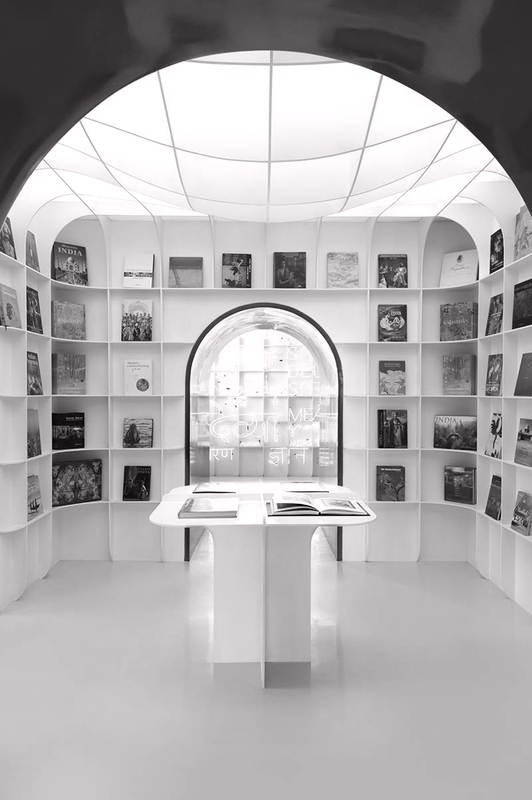 Like an illuminated geometric cavern, it showcases a selection of beautiful books, introducing and guiding visitors towards the central space and Cha Bar. > The bookstore is structured to be a flowing space without doors to give visitors a clear perspective. The transition between spaces is demarcated by the arches of the original architectural structure, except that they are now painted blue. Hindu deities are often depicted with blue skin as a symbol of courage (blue is the colour of Vishnu), and the arches are quickly recognised as symbolising the transition from one room to the next. 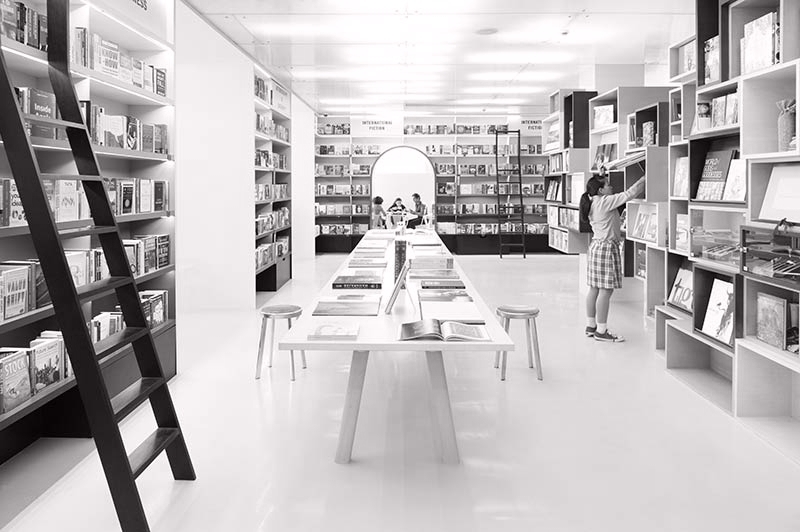 > The central space is much more like a traditional bookstore. Equipped with library steps and ladders, the book-filled shelving entirely covers the walls like a tapestry, creating a practical solution to storing so many books in such a relatively small space. To minimise the physical presence of the shelves, Normal Studio has given them a graphic treatment of graded greys, from black at floor level to white at ceiling level, where the artificial light is washed evenly to accentuate the calm, cosy atmosphere. > The vocabulary of furniture is expressed clearly in the 7.5-metre, 6 splay-legged table in solid light-coloured wood created by the designers with a clear nod to the style of Jean Prouvé. Despite its size, it does nothing to detract from the space, and is unequivocal about its utilitarian identity. Its formal simplicity enhances the single wall of shelving designed as a pile of wooden boxes, whose arrangement makes a clear reference to the Indian vernacular architecture that pervades the urban landscape. The children’s area is designed around a mini-amphitheatre, whose carpeted surfaces invite young readers to sit comfortably, and doubles as seating for readings. > The central space leads into a long, thin lecture room bathed in natural daylight: a quiet space in which to take time to read, take a break or attend a lecture. A large alcove bench seat runs around the walls, providing a place of individual escape and making another comfortable contribution to making this room a multipurpose space. > The Cha Bar is entered through the five blue arches. 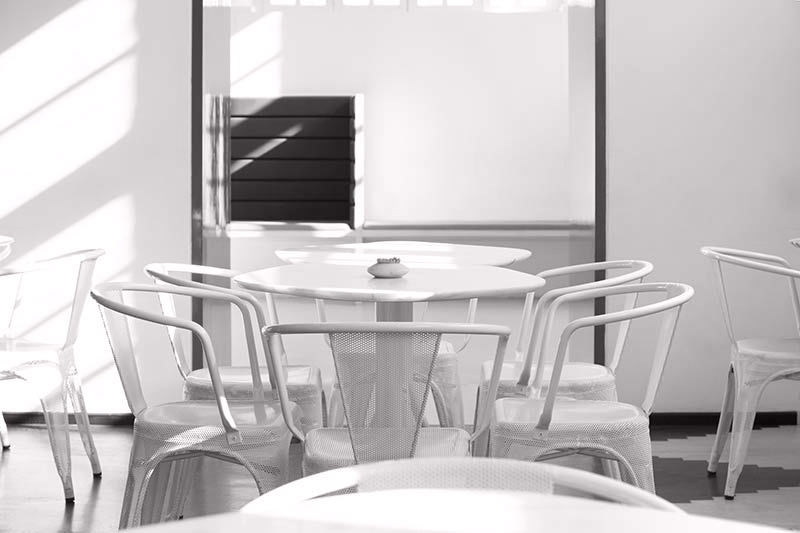 This chic, contemporary cafe is furnished to create a real feeling of serenity. Here, the furniture defines the space. Designed specifically for this place, the marble-topped, metal-based tables adopt a polygonal form, creating freedom of layout and the illusion of random arrangement. 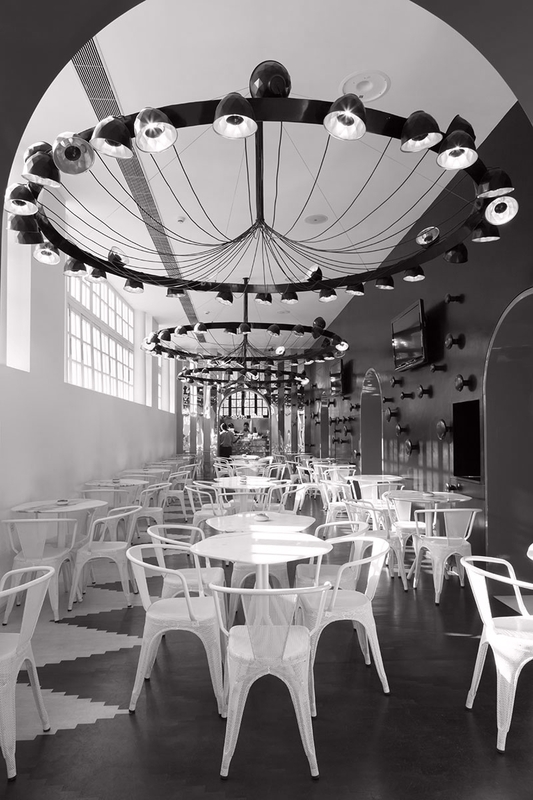 Lighting is provided by enormous circular ceiling units concealing magnetic reflectors whose careful direction spreads light to every potentially-shady corner. And to increase the effect of evenly diffused light, an enormous mirror in folded sheet steel at one end of the room fragments reflections to return a deconstructed image of reality. The Cha Bar succeeds in the challenge of being simultaneously simple and sophisticated. 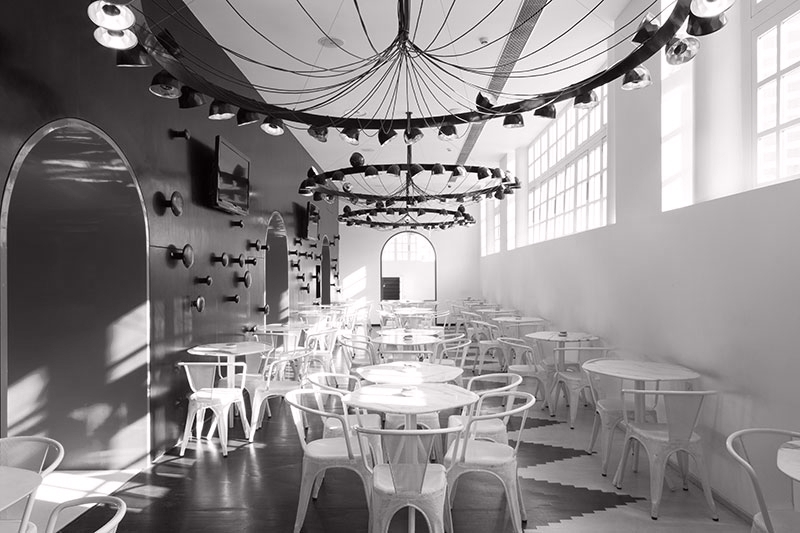 This archetypal laid-back cafe features herringbone parquet flooring in black and white (a reference to the shelves) and white Tolix A56 perforated metal chairs to create a happy marriage of past and present. 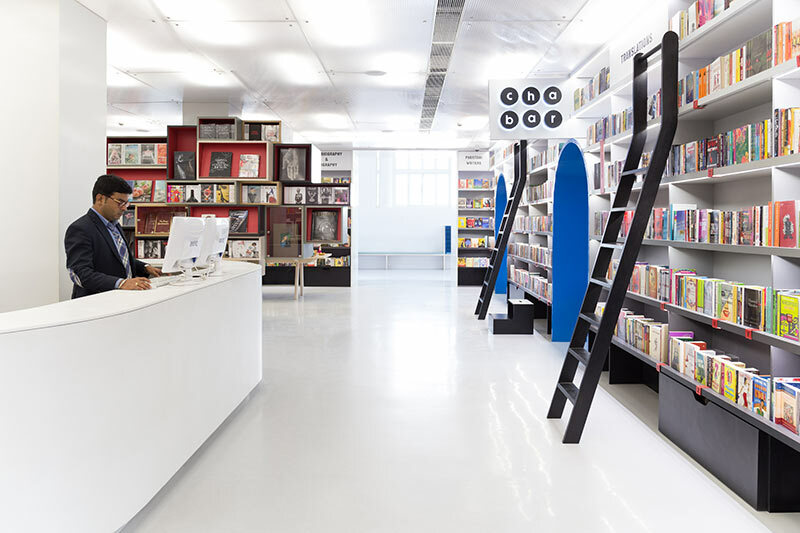 The Oxford Bookstore in Delhi is a wonderful place to meet or just sit in the historic heart of the city, and a place for relaxed refreshment as you leaf through a fascinating art book.